If you’ve read some of my previous articles, you’re probably familiar with sound absorbing panels. In fact, they’re some of the best sound absorbing materials I use around my home. 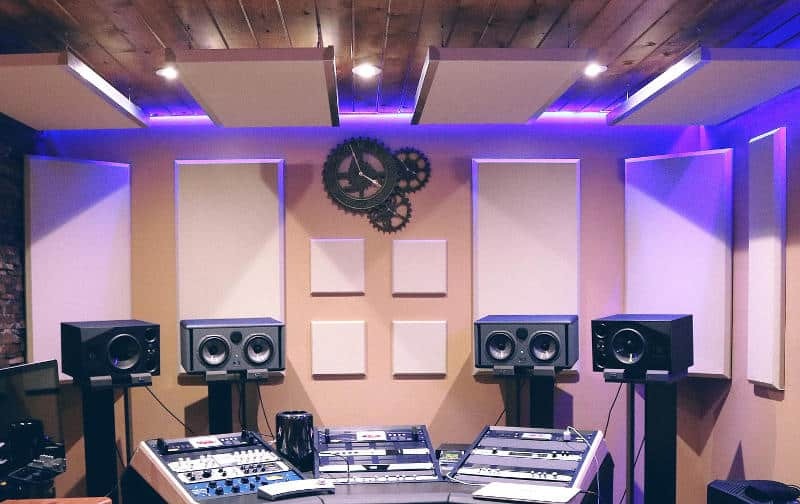 So today, I’m going to tell you about the best acoustic panels on the market, and where and how you can install them. My favorite types of soundproofing products are the ones that can act as both sound treatments and wall decor. Actually, acoustic panels check off both of those boxes: they’re effective, and they look great. I like soundproof curtains for similar reasons as well — although these two types of products are effective in different ways. Another great thing about acoustic panels is that they’re often pretty cheap. And you can easily make them yourself — which I’ll explain later on. However, before I get into my reviews and instructions, let’s take a moment to talk about what acoustic panels are and how they differ from regular acoustic foam products. Acoustic panels are porous sound absorbers you can put on your walls or even on your ceilings. Unlike acoustic foam panels, acoustic fabric panels usually have a wood frame at the core. The frame is usually stuffed with many different materials, including acoustic foam, mineral wool, or even fiberglass. Finally, the whole thing is wrapped in burlap or microsuede. To the untrained eye, these kinds of products can seem pretty similar to regular acoustic foam panels. However, if you look closely at the features of these types of products, you’ll see where they differ. For example, acoustic foam panels are typically much thinner than the products I’ll be reviewing today. What’s more, they’re usually smaller, since sound absorbing panels are generally about 24 inches by 36 inches. In fact, when it comes to the construction of these kinds of acoustic panels, they’re often more similar to bass traps. Specifically, the wooden construction and the fabric cover are features you might see in the microsuede-covered bass trap from ATS. The greatest advantage of products that have fabric covers is that you’re able to take the fabric off and wash it, whereas all you can do with foam products is vacuum them. In my opinion, there’s another thing that distinguishes acoustic panels from foam panels. Usually, acoustic foam panels are pretty plain, although they do come in all sorts of colors and with different patterns. In contrast, some acoustic panels can be downright artistic. Overall, in my experience, acoustic panels come in larger dimensions and more attractive shapes than foam products do. Besides, they often come in nicer colors — and you can even make your own fabric covers for them pretty easily. But I’ve yet to answer the most important question: just how effective are they? Ultimately, all of the different acoustic products I’ve mentioned serve a similar purpose. That is, they’re all supposed to trap the sound waves and stop them from bouncing against the hard surface of a wall or a ceiling. Basically, they improve the acoustic quality of a room by preventing echoes. That is why you’ll often see these products in studio recording booths and in YouTube studio setups. However, you do have to know which placement will give you the best results. If you can’t cover your whole wall or ceiling, you ought to focus your efforts on the center of the surface. In addition, you should probably use bass traps in the corners of the room. And, if you have an unconventional speaker setup, you should take into account the direction in which the sound travels. As for the ceilings, I’ll have more specific suggestions for how you can set up your acoustic panels there later. However, if you have particularly tall ceilings that are causing a lot of echoing, install vertical sound baffles. They’re basically the same thing as acoustic panels, but they’re specifically designed to hang from the ceiling. Now, although acoustic panels do slightly reduce noise levels, don’t rely on them to block noise. So if you’re looking for something that will effectively soundproof a room, you should look elsewhere. Fortunately, I have many guides that deal with soundproofing various areas of a home, including the garage. As you may know, I like to start off every one of my product review articles with a brief shopping guide. If you don’t know anything about the general category of the products I’m about to review, this will act as an introduction. Overall, you’ll probably be familiar with most of the features I’m about to mention. After all, they’re similar to the ones I described in my article about acoustic foam products. So let’s talk about the most important things you should keep in mind as you shop. Most acoustic panel products have an NRC or Noise Reduction Coefficient rating in their product description. The products receive ratings on a scale of 0 to 1 corresponding to the percentage of frequencies they can muffle. In order to get an NRC rating, all acoustic products are subjected to several tests that are meant to determine their absorption levels. Namely, they need to perform sufficiently well with frequencies of 250, 500, 1000, and 2000 Hz. Fortunately, most of the acoustic panels on my list have a rating of upwards of 0.85, which is pretty good. However, I should note that this system isn’t ideal if you want to know whether a product will prevent bass noise. After all, bass and sub-bass frequencies are all lower than 250 Hz. Of course, it’s worth mentioning that putting up a few acoustic panels isn’t going to completely stop sound from bouncing, especially if you still have exposed walls. And it’s definitely not going to do anything to prevent noise from leaving the room, either. Still, having absorbers on your walls is definitely better than not having them, at least if you’re concerned with acoustics. As I’ve mentioned before, most of the acoustic panels I’ll be reviewing are generally sturdier than your average foam panel. They have a wooden or a metal frame inside and are stuffed with some kind of acoustical material. These types of panels are pretty effective. However, if you get the panels that have a sturdy construction, you should know that you’ll have to screw them into the walls. On the other hand, you could always get lightweight panels that resemble acoustic foam tiles more closely. Most of them are made of condensed polyester fibers. That way, you’d be able to install them with pins, tacks, double-sided tape, or even adhesive spray. Of course, I drew your attention to the panel construction because you’ll probably need to worry about it if you have to avoid certain types of installations. For example, many people don’t want to use adhesives on their walls — and many aren’t allowed to drill their walls. 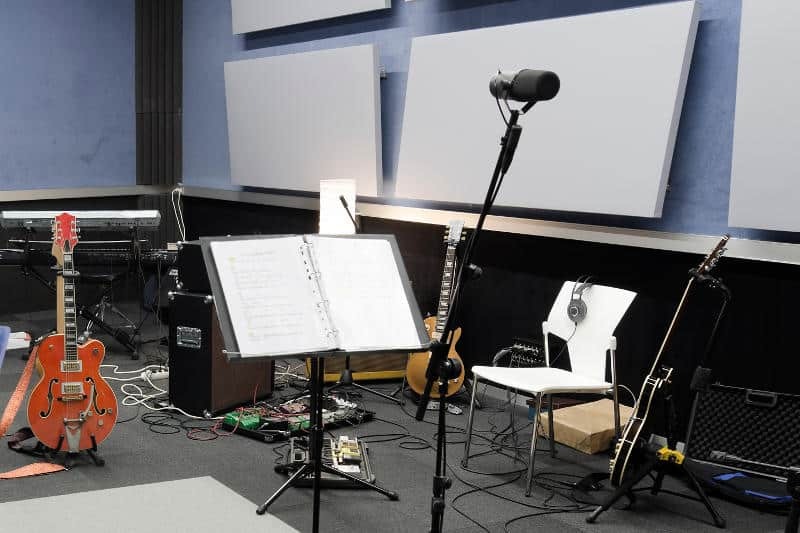 So depending on your circumstances, you’ll need to get different types of acoustic panels. The two acoustic panels I’ve linked to in my list of sound absorbing materials are both 24 inches wide and 36 inches long rectangles. However, some of the products I’ll be reviewing today are longer than that — 2 by 4 feet. Still, the rectangular panels usually stay around 2 by 3 or 4-feet dimensions. I’ll even mention a few square panels that are more reminiscent of regular foam tiles later on. Now if you want your space to look extra stylish you could go for one of the decorative options I’ll review. There are sets that come in different shapes, sizes, and colors you’d be able to arrange according to your preference. The thickness of the panels is another descriptor that plays a huge part in the effectiveness of the product. As always, thicker is better when it comes to acoustic treatments. With that in mind, standard 2-inch thick panels work pretty well — although you could also get ones that are double that size. And, of course, if you decide to make your own panels, you’ll be able to make them in whichever size you prefer. Lastly, I wanted to talk about the number of panels you get in a set. Even though most of them are sold individually, others come in packs of 4, 5, 6, or 8. Throughout my reviews, I’ll make sure to specify the number of panels that come with a purchase. One of my favorite things about the kinds of acoustic panels I’m talking about here is that they’re way more attractive than regular foam tiles. As much as I love those, they can look a bit drab after a while. On the other hand, acoustic panels, especially the decorative ones, can look fantastic depending on the formation you set them up in. On the other hand, you could spruce up your living space by choosing panels in your favorite colors. In fact, I’ll talk about several decorative panels that have paintings printed on them. So if you don’t have any artwork on your walls — you can just get one of these acoustic panels. Now we know everything there is to know about the various features of the products I’ll be discussing. While I’m sharing my thoughts,, I’ll be sure to point out the important features of each acoustic panel I present. With that being said, let’s get into the reviews. If there’s a single brand that’s responsible for the majority of the acoustic panels on the market, it’s probably ATS Acoustics. They have many different types of panels, but for now, I’m going to focus on their most ordinary one. If you’re just looking for something that’s going to get the job done, you pretty much can’t go wrong with these fire rated panels. The rectangular, 24 by 48-inch (or 2 by 4 feet) panels are 2 inches thick. The interior construction is solid wood, which makes this 12-pound panel particularly durable and sturdy. The Class A fire rating is mostly due to the fire resistant polyester Guilford of Maine fabric that encases the internal structure. Furthermore, the inner parts of the panel also have a great fire rating. Speaking of the internal structure, if you opened these up, you’d see Roxul mineral wool insulation inside. The insulation has a density of 3 pounds per cubic foot, so you can be sure that sound waves will get well and truly lost in it. According to users, both the sides and the back of the wooden frame are sturdy enough to drill into. In fact, the panels come with mounting clips that will make them easy to hang. They also come in 10 different colors, from the usual cream, gray, and brown shades, to the more exciting reds, blues, and greens. However, you should keep in mind that these panels are sold individually, so if you need more than one, you should put several of them in your cart. Ultimately, you really can’t go wrong with the basics. However, ATS Acoustics also make several other products you can check out as well. Firstly, I wanted to mention that they do make 4-inch thick versions of the panels I’ve just mentioned. Those ones have burlap covers that only come in 4 colors. However, with an NRC rating of 1.15 out of 1, they seem to be pretty great. And if you don’t like the fabric material, they also make big panels like these with microsuede covers. If you’re looking for something smaller, get the 24-inch square tiles. The 2-inch version has burlap (or jute) fabric in 4 colors, while the 4-inch thick versions have microsuede covers. I imagine the 2-foot square tiles could look great on a wall if you arrange them in an interesting pattern. Now, ATS Acoustics also makes something really interesting I haven’t seen from a lot of other manufacturers. If you want to go the extra mile, they make custom acoustic panels — so you could order any shape, size, and fabric print you want. However, I’m more impressed with their coffee bag panels. Basically, they come in 24 by 24-inch and 24 by 36-inch sizes — both of which are 2-inch thick. But instead of having a boring monochromatic fabric covers, they wrap the panels in international coffee burlap sacks. Although they market these towards coffee shops, cafes, and restaurants, I’d love to have these in my kitchen. They look really rustic and unusual, and they’re highly effective, so there’s no reason not to get them. If ATS Acoustics have any competition, it’s Acoustimac. In fact, I’ve decided to split their products into two categories. So first, I’ll cover their more ordinary products, and then I’ll move on to their artistic line. Since I wanted to give Acoustimac the same chance I gave the regular ATS panels, let’s start with Acoustimac’s basic 4 by 2-foot panel. Like the previous company’s product, these panels are also 2 inches thick and made of fire-resistant materials. Unlike ATS, who actually didn’t state the NRC rating of the first product I’ve reviewed, Acoustimac specified that this panel has a .95 NRC rating or higher. These panels are sold individually, and they weigh about the same as the first ATS panels I mentioned. So that’s about 10 pounds per panel. 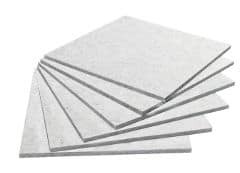 Acoustimac panels have a sturdy wooden frame packed with 4-pound Rockwool insulation and wrapped in suede fabric. They also come with mounting hardware that should make them easy to set up. You have only 4 colors to choose from, but they’re pretty classic, so they’ll work for most rooms. There are black and white versions, as well as khaki and a more golden brown version. Now that we’ve seen the bare basics of the kinds of panels Acoustimac makes, let’s talk about their kits. When I was browsing through their store, I was actually pleasantly surprised by the various panel packs they make. For one, they have 8-piece packs of 4 by 1-foot rectangular panels that are 2 inches thick. Four of the eight panels are in a lighter color while the others are in a darker shade, and they’re always presented in an interesting up-and-down formation. So you can get those types of packs in gray or beige shades. They also have 7-piece sets where 4 of the panels are 2 feet wide and 3 are 1 foot wide, and 5-piece packs with a similar style. There are some sets with panels of variable lengths as well. Finally, I’d be remiss if I didn’t mention the square tile packs Acoustimac makes as well. I’m partial to 10-piece sets like this charcoal and khaki one that comes with five 2-foot squares and five 1-foot tiles. With those kinds of products, you can arrange the different sizes of tiles to your taste. However, if you’d prefer to have something that resembles an art piece more closely — check out the next item on my list. Now, Acoustimac’s artistic panels are what it’s all about! There are many different styles with different pictures printed on the fabric covers. However, I’ll start with these vertical 4 feet tall, 2 feet wide panels. Like all of the previous products we’ve talked about, these panels are sold individually. In this case, that’s the only way to do it since most people don’t want to get two of the same art pieces for their walls. Instead, this product lets you choose between 5 great pictures: a blue and orange microphone, a piano, two different guitar images, and a painting-style picture of a woman playing the cello. As you can tell, these images are music-inspired — but don’t worry. If that’s not something you’re into, I’ll link to some more general artistic panels later. Like the previous acoustic panels I’ve shown you, these ones are 2 inches thick. To my knowledge, they don’t actually make artistic panels that are 4 inches thick. However, these panels have a sturdy wood frame on the inside, and they use Owens Corning 703, Roxul, or their proprietary Eco-Core insulation to fill it. I’ve written about these kinds of insulation batts before, so you can refer to that article if you need help choosing. Finally, the art print is made using a 4-color pigment dye process which produces vivid colors while still allowing the sound to pass through the fabric and get to the insulation under it. In addition to the previously mentioned music-inspired vertical panels, Acoustimac makes ones with different designs as well. Firstly, the exact same product as the one I mentioned above comes with a print of some meditation stones in water and a photograph of a country road. Vertical panels are also available in a 3 by 2-foot size with photo prints of nature. Usually, you’d be able to rotate and hang your acoustic panels in whichever direction you wanted. However, these art panels have orientations you’ll need to keep in mind. Fortunately, Acoustimac does make ones with horizontal prints. For example, these 4 by 2-foot ones come with 7 different nature-inspired images. Additionally, they also come with all the hardware you’ll need to hang them. Like vertical panels, horizontal ones are available in 3 by 2-foot dimensions with 7 different nature motifs. One of them has a separate posting on Amazon which tells you a bit more about the product if you’re interested in seeing all of the specs. Acoustic Design Works make many different styles of acoustic panels, from the most ordinary rectangle ones to hexagonal ones. However, I wanted to showcase their Mondrian kits. These kits consist of 4 panels — 2 squares and 2 rectangles — in various colors. In fact, there are 16 color variations you can choose from. The suggested formation of these panels is to place them horizontally, with a square and a rectangle in the top row and a rectangle and a square in the bottom row. You’re supposed to leave about an inch of space between each panel, recreating the famous art style of Piet Mondrian. When you position the panels like that, they’re 73 inches wide and 49 inches tall. According to my calculations, that makes the squares 24 inches wide and tall, and the rectangles 24 by 48 inches, which are the standard panel dimensions. All together, they weigh in at 18 pounds, and they even come with mounting hardware. As far as I can tell, these panels don’t have the same wooden frame as the other ones on my list. However, the fiberglass insulation inside does have a hardened edge that should make the Guilford fabric cover on top retain its shape. Now, I should note that these panels are only an inch thick — which explains the .85 NRC rating. Still, according to the manufacturer, as long as you cover at least 15% of the total surface area you’re working on, you’ll hear a significant drop in reverberations. Aside from their famous Mondrian kits, Acoustic Design Works make regular 48 by 24-inch panels. Since these panels are only 1 inch thick and weigh only 6 pounds, they may be easier to hang from ceilings. They come in 37 different colors, so you could really use them to elevate your space. However, ADW makes panels that are 2 inches thick as well. For example, their 24-inch diameter hexagon panels also come in 37 different colors. In addition to those panels, they also make diamond layer kits in 8 color variations. Pretty much all of these products are made using the same materials, so only the shape and the thicknesses differ. I wanted to include these Burton Acoustix panels precisely because they’re so different from the other ones I’ve mentioned so far. Even though they’re probably not the most attractive panels on my list, they’re definitely some of the most interesting ones. Besides, they might be the cheapest of all of the acoustic panels I’ve talked about, as they come in 5-tile packs. Rather than having a wooden frame, these panels are simply made of densely packed polyester fibers. The 12-inch squares are only about 0.36 inches thick, so you’ll be able to cut them with a utility knife to the shape you need. Even though they’re fairly thin, the density of the tiles is actually 200 kilogram per cubic meter, which is about 12.5 pounds per cubic foot. All of these features combined earn an NRC rating between 0.90 and 1. Of course, the product’s effectiveness depends on the sound frequency it needs to absorb. As always, lower bass frequencies are more difficult to absorb. Still, these panels also have a Class B1 fire rating so you’ll definitely be safe from . When installing these panels, you’ll be able to use double-sided tape, tacks or pins, and even adhesive spray. And you can pretty much put them anywhere. Either cover your entire wall with them or target the areas where the sound waves are likely to bounce. You can even use them to soundproof your doors or appliances like fridges or laundry machines. Lastly, while we’re on the subject of polyester panels, I wanted to mention another option you could try. The BXI sound absorbers are fairly similar to the previous product I’ve reviewed, so they’re made of condensed polyester fibers too. However, these tiles are available in 5 colors, including black, light beige, green, red, and gray. Unlike the previous product, this one comes with six 16 by 12-inch tiles in a pack. Since they’re about the same thickness as the previous product I’ve mentioned, they’re pretty easy to cut and install. You can pretty much use them for the same things I mentioned with the previous polyester tiles. So, if you want to add some mass to your doors or pad the sides of your laundry machine, these might be just the thing for you. Like the previous polyester tiles, these ones have a Class B1 fire rating and are eco-friendly and odorless. It’s only natural that these kinds of products should perform slightly worse than the thicker products I’ve mentioned. Still, with an NRC rating of .87, I really couldn’t complain. Now that I’ve said all I wanted to say about acoustic panels, all that’s left to do is figure out how to install them. I’ve already told you how to attach the last two products on my list. Basically, approach their installation the same way you’d install acoustic foam products. However, acoustic panels with wooden frames are a different story entirely. If you want to install your panels on a wall, there are several ways to go about it. First of all, if you order one of the panels that come with installation hardware, you’ll probably end up using Z-clips. Even if you don’t get panels that come with these clips, you can still buy them online. This video will show you how to use the Z-clips on your walls. The guy in the video is using ATS panels with some adjustments you don’t need to copy. Basically, they’re meant to create an air gap between the wall and the back of the panel to enhance the absorption. If you want to do that, just screw a piece of cork into the back of the wooden frame. Alternately, the Z-clips can go directly into the wooden back of the panel. Just make sure to keep them at the same distance on the wall. In addition to helping you hang the panels on walls, you can also use Z-clips to attach them to ceilings (check out this video to see how). You could also try using impaling clips like the ones that come with ADW products. The clips are flat on one side and have sharp prongs on the other. So you’d screw them into the walls and simply impale your panel onto them as shown in this video. And if you don’t have the impaling clips, you can also use screws or nails and hang the panel like a painting. If you want to have a more secure attachment, use L-brackets to screw the top and bottom of your panels into the walls or the ceiling. In fact, you can even use L-brackets to attach your panels to a stand with swivel wheels. That way, you’d be able to move them to wherever you need them. Also, if you want to have these panels on the ceiling, you could essentially create a drop ceiling by suspending the panels on metal wires. On the other hand, I’ve mentioned that there are other products that can be hung from ceilings. ATS Acoustics make 2-inch thick baffles that are 48 inches wide and come in 2 lengths: 24 inches and 12 inches. One of the long sides has grommets that can be used to suspend the baffles from the ceiling vertically. I hope that the products I’ve discussed throughout this article will inspire you in your search for the perfect acoustic panels. However, if you still haven’t found the right acoustic panels for your home, don’t worry. You can always make them! This building tutorial video has been my go-to for years because it’s pretty straightforward. But if you don’t want to start from square one, you can also buy an empty wooden frame from Acoustimac and use whichever insulation and fabric you want on it. Just staple the fabric on — when it gets too dirty, you can pry out the staples and throw it in the washing machine. Even though I’m a wholehearted supporter of making your own soundproofing solutions, I also realize that buying acoustic panels is much easier than making them. Whether you need them for your bedroom, your home office, or your gaming room, the products I’ve mentioned would do a great job absorbing excess reverberations.